Experience a day to remember at the Crystal Room, Connecticut's premier facility for memorable moments. Offering a complete CT wedding package, the Crystal Room's staff plan and organize every detail, from the wedding cake and menu to the DJ. Take the stress out of one of the most important days of your life when working with this family owned and operated organization, committed to making weddings special and spectacular for all. Our facility boasts one of the most diverse and scrumptious catering menus in the state of Connecticut, including a five-course meal with choices and tastes that are out of this world. As one of the most sought-after banquet reception halls in CT, the grounds, gardens and our grand ballroom will add an elegant touch to your special day. 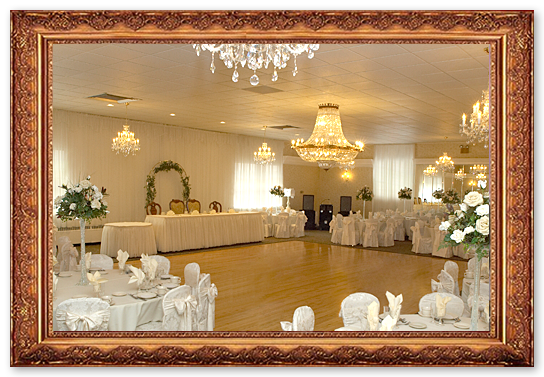 Located in Naugatuck, Connecticut wedding receptions by the Crystal Room, offer a convenient approach to planning weddings. Let us do the work for you! Our satisfied brides and grooms can attest to the fact that our service, dining experience, beautifully decorated facilities and complete package deals are designed to impress and de-stress. We invite you to contact us for a personal meeting, stroll the grounds, or browse our online showroom featuring vivid photos of what could be your special day's destination. The Crystal Room grand ballroom features 12’high ceilings with rich crown molding and custom wood trim and is illuminated by 11 sparkling Swarovski crystal chandeliers. Our large round tables are draped with floor length tablecloths, and are complimented with your choice of colored linen napkins. Surrounded by plush flexible back chairs, the tables surround an extra large permanent maple dance floor, allowing all of your guests to have a great view of you on your special day. The tables are set with fine bone china and are completed with 32” glass vases topped with cascading ivory roses. Our ballroom is spacious enough to seat 250 guests and also features a large mahogany bar stocked with over 100 brands of premium liquors. Our stunning room is yours alone on your wedding day so you can have the personalized service and attention that our reputation has been built on. Your guests will enter the Crystal Room through hand carved solid mahogany doors and become engulfed into a world of elegance. The foyer features a marble fireplace and a hand built spiral staircase that offers an ideal setting for unforgettable portraits during the winter months or inclement weather, or anytime during your reception. Our entrance also boasts large sparkling chandeliers and vibrant floral arrangements. A cozy bridal suite for the wedding party provides a perfect opportunity for cocktails and hors' doeuvres or simply relaxing and refreshing before your grand entrance. Our meticulously manicured garden has as it's centerpiece a beautiful double tiered waterfall cascading around an elevated cobblestone stage, providing the perfect centerpiece for your wedding ceremony, or post wedding pictures. Our garden is complimented by a large Victorian style gazebo and cobblestone walkways. The walkways are surrounded by full tree's, flowering bushes and cascading flowers that offer a vibrant and colorful backdrop for outdoor wedding portraits. Our flowers change year round to compliment the season of your wedding. 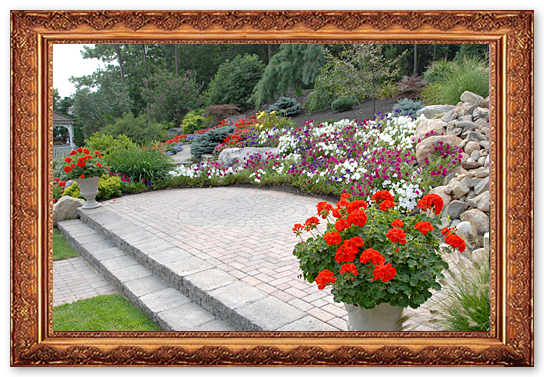 We showcase daffodils and tulips in the spring, summer impatients and geraniums, and a dazzling array of fall mums. Our garden is also an elegant and serene setting for your outdoor wedding ceremony. The garden can comfortably seat over 200 people and offers a beautiful natural background for those who want a garden ceremony.